Certain experiences defy pedestrian terminology: when you're at a mind-blowing stadium show, you're not "enjoying tunes", you're rocking out, and when you nibble chocolate ganache you're not "eating candy", you're savoring a confection, man! On June 13, JetBlue's partnering with Thrillist for Jet Vegas, an epic adventure that showcases how their stellar service isn't mere flying, it's Jetting -- and they want you to join them. Jetting's the only phrase that can possibly sum up travel on JetBlue: bountiful legroom, 36 channels of free DIRECTV, 100 channels of free XM Radio, unlimited snacks, ever-expanding routes (now including Austin, Seattle, and Salt Lake City), and customer service so friendly, you'll trace the receiver with your finger and whisper "I love you" as you hang up the phone. 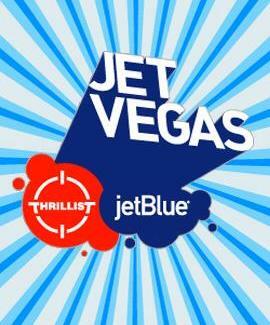 To properly honor the Jetting lifestyle, JetBlue and Thrillist want to offer you a chance to access two private, ridonculous Las Vegas parties pumped up with key contributions from The Mirage, Dos Equis, Showtime, SKYY Vodka, and Diet Coke, with additional participation from Gillette, HUGO BOSS, Equinox, Wines of Germany, and Alka-Seltzer. With all that going on, you won't even have time to sneak out and play Keno. If you want to join the Vegas festivities, we've saved some spots on the guest list -- just click here for a shot at greatness, then hit jetblue.com to book a seat. After this, you'll never be satisfied with "flying" again, though with chocolate, let's face it, you'll put it in your mouth no matter what it's called.